Operators often think of using outrigger pads when they are setting up cranes or other outrigger-enabled equipment on soft ground. But very hard ground presents its own challenges for sufficiently reducing the ground bearing pressure. Kris Koberg, CEO of DICA, recently addressed this issue in a Guest Perspective published in Crane Hotline magazine. “Simple Ways to Improve Outrigger Pad and Crane Mat Performance on Hard Ground,” shows how placing an intermediate layer or buffer between the ground and the outrigger pad or crane mat can reduce peak and overall ground bearing pressures. Read the full article below or in the September 2017 issue of Crane Hotline magazine. Kris Koberg is CEO of DICA, Guthrie Center, Iowa. He oversees strategic vision, product line development, and operations for the family-owned and operated company. Since 1988, DICA has been creating engineered solutions for improving equipment stability and ergonomic safety with SafetyTech® outrigger pads, FiberMax® crane pads, and ProStack™ cribbing. When cranes must be setup on very hard surfaces, owners are often challenged with sufficiently reducing the ground bearing pressure to meet jobsite requirements. A common misconception regarding the load distribution of crane pads and mats is that outrigger loads are evenly distributed across the entire mat area. Unfortunately, this is not an assumption that can be made. Often, less than 50% of the mat may actually be transferring load to the ground. In order to achieve even, equal, and predictable distribution over the mat area an infinitely rigid material would be required. In the world we live and work in, there are not any infinitely rigid materials—not even high-strength steel. Because of this, there will always be some level of peak loading under the outrigger foot. Actual distribution of the load depends on the mat material, design, construction, and condition and the stiffness of the ground under the mats. Some movement and compaction of the ground allows for pads and mats to deflect. Managed deflection of pads and mats improves overall load distribution because it increases the contact area between the mat and the ground. Even with engineered outrigger pads or crane mats, some deflection is expected. However, hard ground presents different challenges. Consider environments where cranes must be setup on concrete, rock or other very hard surfaces, such as roadways, refineries, manufacturing plants, or shipyards. Hard ground does not allow for pad deflection. Typically, in these conditions load distributes at an angle of 45-60 degrees which results in high peak pressures, and high overall ground bearing pressure. Often, this is not recognized or understood which results in higher ground bearing pressures than are intended. 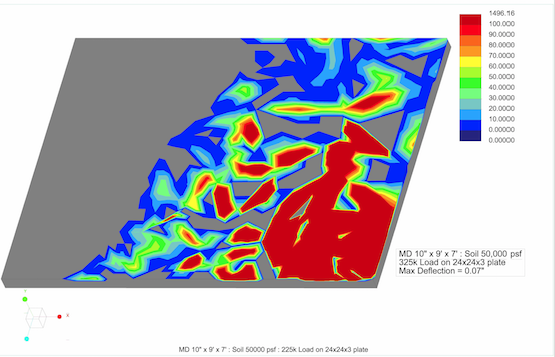 To reduce ground bearing pressure in very hard ground conditions, consider introducing a softer intermediate buffer layer that allows for managed pad deflection to occur. Commonly used intermediate buffer materials include sand, Chips & Dust aggregate products, plywood, or inorganic materials with high compaction strength, such as neoprene or rubber. All are viable solutions. Sand and chips and dust compact under load allowing for deflection as they squish under the forces being exerted. They can protect the ground surface, but it’s messier than other options especially when it comes to clean up. Plywood may also help get the job done, but it’s an organic material with unpredictable properties. It often becomes a disposable item that can’t be reused. Meanwhile, neoprene mats are simple, clean and easy to use and re-use. Because neoprene is a man-made product, it has quantifiable performance properties that can be modeled. This results in consistent, predictable, and quantifiable results. Regardless of the type and construction of the outrigger pad or crane mat you are using, any of these intermediate buffers will help with improved load distribution and the achievement of lower ground bearing pressures. DICA customers have shared with us with the challenges of working in very hard ground conditions. We have suggested that intermediate layers or buffers can help them meet specific job requirements. At DICA, we use Finite Element Analysis modeling to project actual results of different set ups. By using this technology, we demonstrate how significant reductions in peak and overall ground bearing pressures are achievable by adding an intermediate neoprene layer. 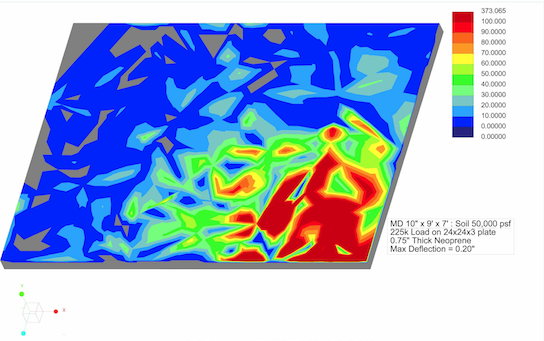 Finite Element Analysis model of pressure being exerted onto the ground under a defined crane pad, where Load = 225,000 lbs., Outrigger Foot Dimensions = 24”x24”, Crane Mat = DICA FiberMax 9’x7’x10” pad, and Soil Condition = Very Hard. Red indicates areas of peak pressure. The gray area indicates there is no contact with the ground under the mat. Image 1 (above): Crane mat on very hard ground. No intermediate buffer. Image 2 (above) Crane mat with ¾” thick neoprene was used as a buffer between the very hard ground and the crane pad. In this case, contact area—and therefore load distribution—was improved by nearly 100% and the resulting peak pressures were greatly reduced. While the specific prescription depends on many factors, generally we have found that neoprene mats that are ¾ in. to 1 in. thick produce optimal results. At this thickness, the amount of deflection can be managed within acceptable parameters. Many of our customers are facing ever more stringent requirements for reduced ground bearing pressures. This may be due to greater regulatory attention on equipment setup, or site owners who are more risk-averse to unknown ground conditions, or a lack of understanding of how crane pads and mats distribute load. When working in very hard ground conditions with strict load reduction requirements, using an intermediate layer as a buffer can help you get the optimum performance out of your outrigger pads or crane mats.